Most (all) of my posts are polished off before they get posted on the site here. I figured I'd start sharing a bit of stuff behind the scenes as it were and show you all what's on my desk each Saturday. You can see what I've been working on over the past week, what I have to do and the general state of affairs. You can see my desk is no different than anyone else's out there, I've got paints and brushes and bits all over the place. This past week, I've been cleaning up some Raven Guard models for my friend. He wanted them touched up. I'll have the squad ready to show next week in a real post. The picture is slightly bigger than normal so you can get a better look at the stuff I have lying around and look for all the little "Easter Eggs" lying around on my desk. The rabbit cup is called is Mr. Bun for those want to know. Are those some Chaos bits in the background? Does this mean that we can look forward to some Chaos conversion or other? That would be awesome! Hm, working on a vehicle soon or is that rhino door meant for something else? Nice to know I'm not alone in having a desk covered in mess. Mr. Bun is for paintbrushes... he would not stoop to holding water. Those two cups sit right next to him. KrautScientist: Don't judge. I didn't want to buy a whole box just so I could paint a couple models. Krisken: I do have some vehicles to do, but that door is for measurements only right now. I thought you mostly used craft paints. Did you switch to GW paints? Harrower: Mostly washes and Foundations. The craft paints make up the bulk of my paints still. In the case where I need a specific color (GW) for a project, then I'll pick it up. I like Mr. Bun. I've got a Darth Vader helmet mug similar to Mr. Bun (?) that I use to hold water on my desk. Mr. Bun once held an upper level management position in the Graphics Department of a major newspaper organization. Now he spends his days mocking my paintjobs and holding onto a whole host of paintbrushes. Hello, I recently started viewing your blog. I really do like it I must say, but I did want to ask one thing about your setup. 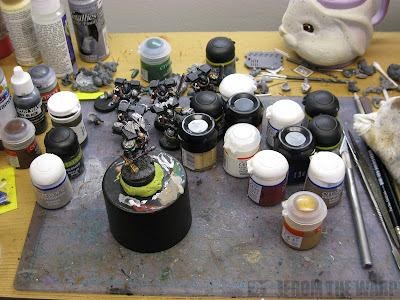 I keep seeing that yellow putty like substance you use to mount your models in your posts, so might I ask exactly what that is or be directed to a post that goes over that? Anon: It's poster tack (sp). It's the tacky stuff you can use to put things like posters up on walls without having to put holes in the wall. It's tacky enough to hold models to the top of the spray paint can tops I use so I don't have to handle my models while painting them.